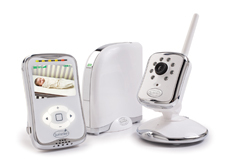 The Peek Plus Internet Baby Monitor System is completely web and APP-based. There is no software to load on your PC or MAC. All you need is to have one of the required browser versions: Internet Explorer 7.0 or higher, Safari 4.0 or higher, Mozilla Firefox 3.0 or higher or Google Chrome. Also, Make sure you have the latest version of Adobe Flash Player which you can download at www.adobe.com/support/flashplayer/downloads.html. You can also access the internet viewable website on your smartphone after downloading the FREE Summer Infant APP. See APP Support section for more details. Do I need a PC running at home to use Peek Plus? The Peek Plus Internet Baby Monitor System does not connect to your computer. It connects via an Ethernet cable to your Internet router for direct Internet access. Or, you can use a qualified smartphone and the FREE Summer Infant APP to view the camera in baby’s room. You can also view our APP on an Android or iPad tablet (APP is not optimized for larger, tablet screen sizes). How far can the Peek Plus camera be located from the gateway? The camera has a wireless range of up to 600 ft. line of sight (LOS) from the gateway. The range can decrease based on environmental factors such as metal obstructions, wall and ceiling thickness, and other such obstructions. In general, your Peek Plus wireless network will have a wireless transmission range similar to an 802.11 wireless device. Will Peek Plus interfere with my wireless network at home? Peek Plus will not interfere with your wireless network (or cordless phone) nor should your wireless network interfere with your Peek Plus system. At what frequency do the cameras and gateway communicate? At the installation location of your gateway, you need a broadband Internet connection (cable/DSL) with recommended upload speed of 300 kbps and/or wireless router or a cable/DSL modem with an available Ethernet/LAN port to properly access and view your camera. You must have a required browser version Internet Explorer 7.0 or higher, Safari 4.0 or higher, Mozilla Firefox 3.0 or higher or Google Chrome. Make sure you have the latest version of Adobe Flash Player which you can download at www.adobe.com/support/flashplayer/downloads.html. Which PC browsers are supported? Supported browsers are: Internet Explorer 7.0 or higher, Safari 4.0 or higher, Mozilla Firefox 3.0 or higher or Google Chrome. Also, make sure you have the latest version of Adobe Flash Player which you can download at www.adobe.com/support/flashplayer/downloads.html. Which Mac browsers are supported? Supported browsers: Internet Explorer 7.0 or higher, Safari 4.0 or higher, Mozilla Firefox 3.0 or higher or Google Chrome. Also, Make sure you have the latest version of Adobe Flash Player which you can download at: www.adobe.com/support/flashplayer/downloads.html. Your Peek Plus gateway does not connect to your computer. It connects via an Ethernet cable to your Internet router for direct Internet access. A compatible Internet browser with broadband Internet access or qualified smartphone with the free APP is required to view the cameras but this does not have to be located at the site of your Peek Plus product. You can also view your baby on any Android or iPad tablet however it is not optimized for tablet viewing.